The Slot Game That Will Make You Want to Get up off Your Seat and Dance! If you've played some games at Novomatic casino, then you already know just how incredibly innovative these designers are. With its thrilling theme, Flamenco Roses is yet another dazzling addition to the roster. The backdrop of this game resembles a beautiful Spanish sunset. Boasting five reels and 10 paylines to make all of your European vacation dreams come true, this sensational slot is nothing less than a dream come true. Instead of taking a siesta, why not spend some time indulging in this entertaining game? There's so much to love about this slot, which easily rivals other big hits from the team at Novomatic. If you've relished the challenge of playing great games such as Easy Peasy Lemon Squeezy, Dragon's Pearl, Dolphin's Pearl Deluxe and Dice Winner, then this game is sure to provide your next big thrill. Are You a Spanish Rose? Spin These Riveting Reels and See What Happens! If you like to enjoy some magnificent music while playing your favourite slot games, then you are truly in for a treat with this one. With great guitar action, these tunes will transport you to a more relaxing time and place. Allow yourself to become swept up in the magic that is Flamenco Roses and keep an eye out especially for the all-important yellow rose. This will be your scatter symbol, so it's always a welcome sight. If and when it happens to make an appearance on your computer screen, you won't be able to miss it. There are a lot of intriguing symbols when you play this game, however, so keep your eyes peeled for even more marvels. There's a dark and handsome man who resembles a matador and he will serve as your wild. You will be delighted by the way in which the colour scheme totally suits the theme. With bright oranges and deep purples, the playing card icons could even resemble the splendour of a Spanish sunset. Those who appreciate the design work that went into slots like Cupid's Arrow, Dragon's Wild Fire, Dr. Enlarge O and Fabulous Fruits are sure to get into this game. The Music Gets Even More Animated When You Win Some Free Spins! 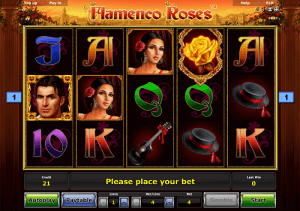 Although free spins are always a great thing, they receive the special treatment in Flamenco Roses. Listen closely as your screen lights up and enjoy all of the possibilities that will appear right before your very eyes. There's a guitar, a ruby necklace, a gorgeous golden bracelet and even a beautiful brunette to spark some joy in your life. Players who have enjoyed their time with games like Fairy Queen, Dutch Fortune and Flame Dancer will immediately catch the infectious vibe of this slot. There's something so alluring about the way in which the slot operates. With lightning-fast, luscious looks, it's no wonder that Flamenco Roses racked up an impressive fan base in such a short period of time. Many people who played it for the first time decided that they had to add it to their regular repertoire. When you want to indulge yourself in a world that's both romantic and full of potential, then it's time to play. This is a slot game that is steeped in the majesty and tradition of a land that boasts a bold and impressive heritage. Allow yourself to feel moved by all of the drama and intrigue; play Flamenco Roses whenever the mood strikes, and permit yourself to let loose while listening to the great tunes. With the ever-popular Gamble feature, this game even offers players a chance to leverage their winnings into something even more spectacular. Simply predict whether the winning colour will be black or red, and you may find yourself falling into even more good fortune. Dust off those dance moves, and infuse yourself with the sensational Spanish spirit that permeates this slot. There's nothing quite like the adrenaline rush you'll get if you happen to rack up some fixed wilds. You may even get to see the female flamenco dancer break out into her favourite steps! Luxuriate in the lovely flair you'll feel every time that you log on to this game. The best part is that you're in your own environment, so it's okay to test out a few flamenco dance steps if you'd like. Don't be afraid to go bold, because flamenco is all about spectacular self-expression. It is this terrific trait that lends the game power and strength, influencing players to reach out for their ultimate dreams. There are some slot games that just have a knack for reaching players and bringing them into a new and exciting environment. This is one of those rare slots. Exceeding the expectations of all who play it, this dance-based delight is sure to get your toes tapping. Rejoice in the magical mysteriousness of this classic slot, and don't be afraid to put it all on the line. In the daring dance of flamenco, as in life, it pays off to take a few risks sometimes.